Summer 2018 was warm, dry and largely sunny. Temperatures were well above average and we received only about 75% of a typical summer’s rainfall. The economy recovered from the financial crisis but growth remained sluggish. The pound fell, inflation rose over 2% and interest rates remained low. Probably the most influential economic factor of the year was the continued uncertainty over Brexit but on the whole, a reasonable economic picture and a very good summer. How did that translate into our industry’s performance? An almost identical picture to the one given last year; once again over 90% of the survey respondents enjoyed a year that was somewhere between OK and Extremely Good. This question is always open to interpretation. Is that ‘biggest influence’ a positive or a negative? Well, 2018 was a good year for business and we enjoyed a very pleasant summer so let’s assume that the weather is a positive influence. To add a little more detail to the picture, let’s look at some of the comments to this question. “There seems to be very little confidence out there. “The Internet is killing off small pool builders such as me. We rely on equipment and chemical sales to keep us afloat during the lean months. “Brexit has created uncertainty in consumers. One thing seems apparent, over 30 months after the referendum, the uncertainty over Brexit has become a constant background to business in the UK. Even as this report is being compiled, we have no real idea of how the Brexit issue will stand when the report is published in just a few weeks time. But let’s try and look into the future anyway. Over 86% of the survey respondents expect to enjoy a year that will be somewhere between OK and Extremely Good. One of the insights that the Survey has given over the years is that businesses typically expect next year to be pretty much like the year just gone. So most respondents have an optimistic view of 2019, but we also asked what actual challenges did they think that the year might hold? These were some of the responses that we got. Just over 30% of the comments specifically mentioned Brexit but 20% of the comments were about staffing issues, particularly the difficulty in finding staff with the right qualifications and training. We were extremely glad to see that the person who has responded to the question with the comment “Old age.” every year for the last eight years, is still with us. During 2018, how many of the following products did you install? In the main, actual reports sales are down on last year’s figures although these are numbers reported by survey respondents and do not indicate industry totals. The sales figures relative to each other have remained the same with two exceptions. The total number of sales, in this sample, of saunas and steam rooms has doubled when compared to last year’s figures. There has also been some growth in in-ground indoor pools – 74 last year up to 95 in this year’s sample. This question always raises the issue of actual, accurate industry wide totals for some of these sales. 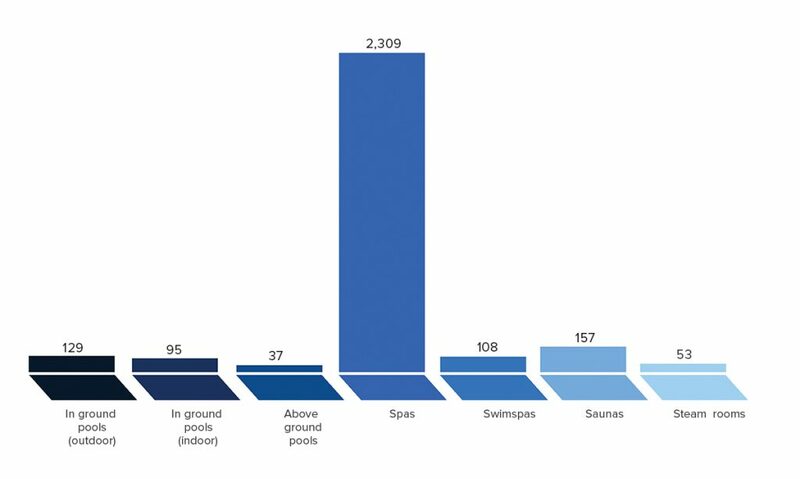 It would be useful to know exactly how many pools exist in the UK and how many new pools are being built every year. There has already been comment on the fact that far more pools are being refurbished than new installations being built. It would be useful to have industry wide figures on this as it does have implications for the shape of our industry in the future.